Michael Hoey is two shots behind the leaders at the China Open after an impressive three-under-par 69 in Thursday's first round. The Belfast player had a superb run of five birdies in six holes from the second in Shenzhen although he dropped shots on 12 and 16. Spaniard Alvaro Quiros and England's Simon Dyson share the lead. Gareth Maybin struggled to a 77 with the Ballyclare man carding a double bogey, four bogeys and one birdie. Shane Lowry is level with Damien McGrane one over and Pater Lawrie six over. Play was suspended because of fading light although only a small number of players had yet to finish their first round. 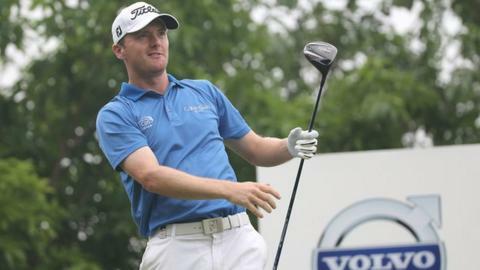 Hoey continued his good form from last week, when he finished in a tie for 18th place at the Malaysian Open.